Sarah Hale changed the world by writing letters. Find a cause you believe in and start a letter-writing campaign to support it. How about getting the United States Postal Service to honor Sarah Hale with a stamp? Visit the USPS website for more information. Write a letter to Sarah Hale describing the Thanksgiving customs in America today. When Sarah was a young woman, she belonged to a club of friends called The Coterie. They met regularly to discuss books and interesting articles in the newspapers and magazines. They also wrote poetry, stories and short plays which they sometimes acted out. Start your own Coterie. Choose meeting times and places, create a reading list, and ask club members to share their own writing. Be sure to serve plenty of refreshments! What does “prolixity” mean? How could you revise Sarah’s advice so that it makes more sense to us today? Can you use fewer words than she did? Compare and contrast the Revolutionary and Civil Wars. How were they connected? What were the causes of the two wars? Could the Civil War have been prevented if the Constitution had been written differently? Sarah Hale’s father, Gordon, was a Revolutionary War soldier. Imagine what it must have felt like to be so closely connected to those two bloody wars and write journal entries describing your feelings. Research the history of another holiday, like Labor Day, Arbor Day, or Flag Day. Create a multimedia campaign to make the holiday more popular. Use the resources in your library to find strange and silly holidays. How often does the government recognize new holidays? What are the steps to official recognition? What was the last federal holiday authorized by the President? 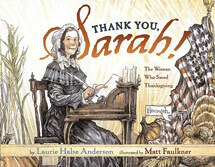 During the research of Thank You, Sarah, Laurie Halse Anderson discovered that she was a distant relative of Sarah Hale. Laurie’s ninth great-grandparents, William Buell and Mary Post were Sarah’s fourth great-grandparents. (William and Mary were English immigrants who lived in Windsor, CT in the mid-1600s. Laurie is descended from their son Peter, and Sarah was descended from their son Samuel.) Trace back your own family a few generations and create a family tree. Where did your family come from? When did they move and why? What are your family traditions that have been handed down for generations? Study how the shape of America changed over Sarah Hale’s life. Create maps that show the United States in 1788, the year she was born, and 1879, the year she died. How many states were added? How many square miles? What natural resources did the new states bring to the national table? Research the geography of the Civil War. Create a map that shows the states, which joined the Union and those which joined the Confederacy. How many miles did soldiers from Atlanta, Georgia walk to get to Gettysburg, Pennsylvania? Where was Washington, D.C. in the conflict? How might that have affected the course of the war? Study population statistics for the years 1861-1865. Figure out the percentage of the population that was affected by the Civil War. What percentage of men were soldiers? What percentage were wounded? Died? The data on this PBS site will help get you started. Research how many turkeys are eaten for Thanksgiving every year. Can you find out how many pounds of potatoes are cooked or how many pumpkin pies are eaten? What is the average number of calories consumed at Thanksgiving dinner? When Sarah Hale was pregnant with her third child, her health failed, and the doctors said she would soon die. Her husband David took her into the mountains for six weeks and fed her grapes. Sarah believed that the “grape cure” saved her life. She ate grapes every day for the rest of her life. David died of pneumonia a few years later. Grapes didn’t save him. Why were grapes considered a cure? Why didn’t Sarah or David take antibiotics? What other bizarre remedies were prescribed in the 1800s? Experiment by making your own ink. Your kitchen is a laboratory and your turkey is a science experiment. What kind of bacteria can live in raw poultry? How can those bacteria infect stuffing? What happens if those bacteria move into the stomachs of your Thanksgiving guests? How can you prevent that from happening? Sarah Hale wrote all her letters and books by hand, using a quill pen and bottles of ink. Research how ink was made in the 1800s. What raw materials went into ink production? Along with writing letters and editing Godey’s, Sarah Hale wrote novels, biographies, and poetry. She also wrote Mary Had a Little Lamb, based on a true incident that happened when she was a young schoolteacher in New Hampshire. Using the tune to Mary Had a Little Lamb, write new lyrics that tell how Sarah saved Thanksgiving. Bonus question: how are Sarah and her famous poem connected to Thomas Edison? In Thank You, Sarah, Sarah Hale is described as a super hero. Draw a picture of Sarah as an exaggerated comic book super hero. Draw other historical figures in this style. What kind of secret weapon would you give George Washington? Harriet Tubman? Franklin Roosevelt? Matt Faulkner, the book’s illustrator, has hidden some extra historical figures in the pages of Thank You, Sarah? Can you find them? How does an artist like Matt find out what people wore more than one hundred years ago? Study the illustration that shows the two armies clashing in the Civil War. How did Matt use art to show emotion, as well as historical detail?